Launched in 2012, the Policy Talks @ the Ford School event series welcomes some of the world's top policymakers to address a variety of compelling topics and engage with our community through public lectures and other activities. Each year, several of our Policy Talks are achieved through generous endowments including the Citi Foundation, Josh Rosenthal Education Fund, and the Harry A. and Margaret D Towsley Foundation. In 1999, the University of Michigan officially named the School of Public Policy in honor of 38th President of the United States [Gerald R. Ford] (AB '35, HLLD '74). In recognition of this occasion, many individuals, corporations, and foundations made gifts to honor President Ford and to assist the school in enriching its programs. In 2000 the Citi Foundation (formerly known as the Citigroup Foundation), through a generous endowed gift, established the Citi Foundation Lecture Series. 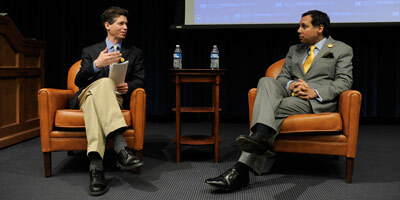 The lecture series, honoring President Ford’s long affiliation with Citigroup, Inc., brings prominent policymakers from the national and international arenas to the Ford School each year to engage students and faculty in dialogue and to give a public address. "Knowledge is key to achieving personal and professional success, and we are pleased to strengthen our commitment to education by providing the University of Michigan with an endowment to establish this permanent lecture series. The experts featured in the series will offer invaluable insights, enrich the overall learning experience, and better prepare students to become the next generation of public policy leaders." View all Citi Foundation lectures. 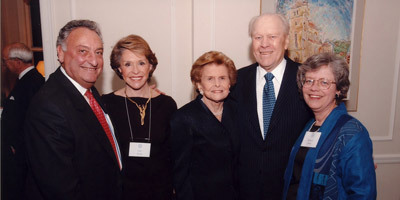 The Meijer Family established the Vandenberg Fund to honor U.S. Senator Arthur Vandenberg, who served the State of Michigan in the U.S. Senate from 1928-1951. Senator Vandenberg forged bipartisan support for our country's most significant and enduring foreign policies of the twentieth century, including the Truman Doctrine, the Marshall Plan, NATO and the creation of the United Nations. Established in 2001, the Gilbert S. Omenn and Martha A. Darling Health Policy Fund provides funding for health policy faculty and health policy outreach activities, including collaborations with the UM Health System, Medical School, and other Health Sciences Schools across campus. Martha Darling is an education policy consultant based in Ann Arbor, Michigan. Among recent clients are the National Academy of Sciences and Museums in the Park, Chicago's major museum consortium. Gilbert (Gil) Omenn, M.D. is the H. T. Shapiro Distinguished University Professor of Medicine at the University of Michigan. He is the director of the UM Center for Computational Medicine & Biology and the Proteomics Alliance for Cancer Research. He served as Executive Vice President for Medical Affairs and as Chief Executive Officer of the University of Michigan Health System from 1997 to 2002. View all Gilbert S. Omenn and Martha A. Darling Health Policy Fund lectures. President Ford with Josh Rosenthal at the University of Michigan Washington Summer Intern Program reception. April, 1978. The Josh Rosenthal Education Fund supports this distinguished lecture series. This fund was established in memory of Josh Rosenthal, a 1979 University of Michigan graduate who died in the World Trade Center attacks on September 11, 2001. Josh earned a masters degree in public policy from Princeton University, and his deep interest in policy analysis and international affairs led him to work in the field of international finance. After Josh's death, his mother, Marilynn Rosenthal, a long-time faculty member at the University of Michigan, sought a way to make some positive meaning from what had happened on 9/11. She and others worked to establish the Josh Rosenthal Education Fund, which has enabled the Ford School to bring leading public policy figures to Ann Arbor each September to share their insights, foster dialogue, and generate greater understanding around the causes and consequences of 9/11. Josh's family and friends established the Josh Rosenthal Education Fund at the Gerald R. Ford School of Public Policy to honor his memory and his interests. The Rosenthal Fund supports lectures, special seminars, student research, internships and other programs, encouraging new and deeper understandings of international issues. 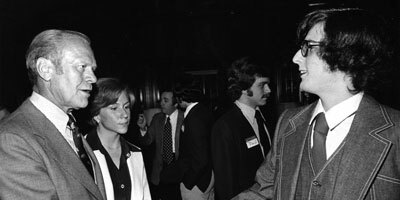 The Harry A. and Margaret D. Towsley Foundation Policymaker in Residence Program was established at the Ford School in 2002 to bring individuals with significant national and/or international policymaking experience to campus to interact with students and faculty. The Towsley PMR program enhances our curriculum and strengthens our ties to the policy community. As part of their residency at the Ford School, all Towsley PMRs deliver a public lecture at the Ford School on topic in their field of specialization. 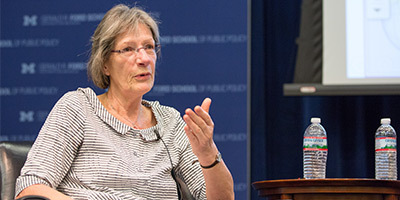 View all Towsley Foundation lectures.